The Ducks suffered their first series loss since July 22nd, falling to the Blue Crabs 9-1. The Ducks opened the scoring in the second inning on Dioner Navarro’s sacrifice fly to left field off Blue Crabs starter David Wayne Russo. Southern Maryland responded with two runs in the third on Angelys Nina’s RBI double and Ryan Strausborger’s sac fly to right. Three more runs in the fourth inning off Ducks starter Jake Fisher extended the Blue Crabs lead to 5-1. A two-run home run to left field by Frank Martinez and an RBI single to right field by Strausborger did the damage. Southern Maryland rounded out their scoring with two more runs in the sixth and a pair of runs in the eighth. Russo earned the win, tossing six innings of one-run ball, allowing one hit and four walks while striking out five. Fisher took the loss, giving up seven runs (six earned) on nine hits over five innings with four strikeouts. Carlos Pimentel struck out the side in a 1-2-3 seventh inning for Long Island, while Fernando Abad pitched a scoreless ninth inning for the Flock. Chris Pike will start for the Ducks in a spot start scenario, but it will be his second consecutive start. The righty owns a 7.10 ERA in four appearances with the Ducks thus far, allowing five runs in six and one-third innings of work. Pike lasted three and one-third innings on August 6 against the Patriots, allowing two runs on two hits and two walks in a 7-2 victory. The Long Island native was primarily a starter in the Tampa Bay Rays organization from 2014 to 2017, reaching Triple-A last year. The 25-year-old was also a participant in the Ducks open tryout before the season. Atlantic League mainstay Kyle Simon will face the Ducks on Friday. The 6’6″ right-hander is 7-6 this season with a 4.04 ERA over 18 appearances (17 starts). Simon last appeared on August 12th, taking the loss against Lancaster after allowing four runs in five innings of work. After spending the first four seasons of his career in the Philadelphia Phillies and Baltimore Orioles organizations, reaching Triple-A Lehigh Valley in 2014, Simon has been an Atlantic League arm since 2015. Simon was named an All-Star in 2016 with the Bees, pitching to the tune of a 2.77 ERA over 120 and one-third innings. BOT 1: Chris Pike starts the game the right way, retiring the side in order! TOP 4: HUGE inning for the Ducks, who plated four runs after an RBI single by David Washington, a two-run double by Ramon Cabrera, and Miles Williams’ first homer as a Duck! TOP 5: A pair of two-out doubles by Daniel Fields and Lew Ford extend the Ducks’ lead to 5-0! BOT 5: Bees storm back with five runs in the frame to tie the game. BOT 6: Bees take a 7-5 lead with a pair of runs in the inning. FINAL: Evan Scribner converts his 20th save of the season and the Ducks fall 7-5 in the series opener. 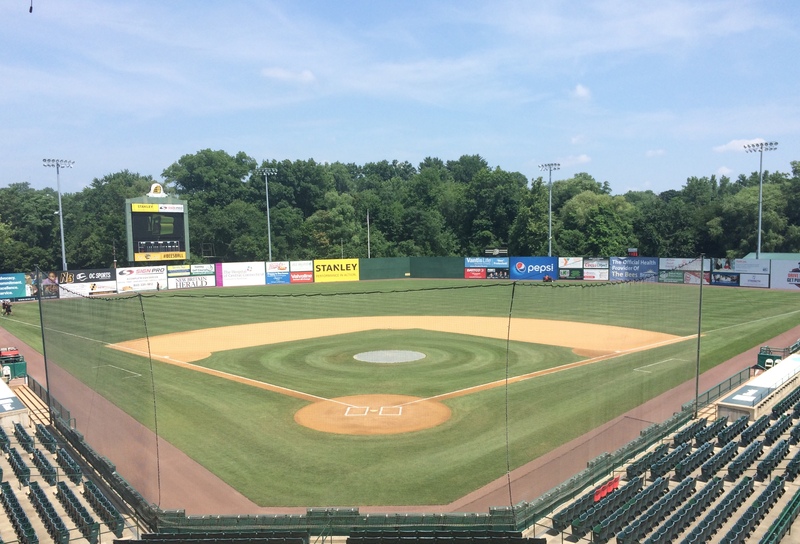 The Long Island Ducks and New Britain Bees open their three-game series on Friday evening. This will be the fourth of 18 scheduled meetings between the Ducks and Bees this season and the 44th all-time meeting between the two teams. Long Island trails New Britain by one game all-time with a 21-22 record against the Bees, and won the first 2018 series two games to one. Long Island owns a 12-8 record when welcoming the Bees to Bethpage Ballpark. The Ducks bring an even 15-15 record to Friday’s game, three and a half games back of the Somerset Patriots for the Liberty Division lead, while New Britain holds a 12-19 record, sitting in third place in the Liberty Division. After Wednesday’s heartbreaker, the Ducks were unable to bounce back against the Skeeters, falling 1-0. Starter Jake Fisher threw five shutout innings before surrendering a run in the sixth inning off a Matt Chavez RBI single. After finishing the inning, Fisher handed the game over to the bullpen where Ashur Tolliver and Carlos Pimentel tossed a pair of scoreless innings. Unfortunately, the Ducks bats were absent, recording scattering four hits over nine innings. Newcomer Taylor Ard roped a double in the second inning, which went down as the Ducks lone extra-base hit of the night. Fisher took the loss, allowing the game’s only run in the sixth inning along with six hits, two walks, and seven strikeouts. James Russell earned the win in relief, pitching two innings, allowing two hits, and striking out two. Felipe Paulino recorded his league-leading ninth save, setting down the Ducks in order in the ninth. The series opener will feature John Brownell on the mound for Long Island. The right-hander recorded his second straight quality start in his last outing one week ago, going seven innings and allowing two runs on five hits in a hard-luck loss to the Patriots. The pitching coach now owns a 2-3 record with a 4.55 ERA over five starts and 27 and two-thirds innings. In his career against the Bees, Brownell is 2-2 with a 2.48 ERA in six starts, including three complete games, striking out 38 over 40 innings. Atlantic League mainstay Kyle Simon will face the Ducks on Friday. After spending the first four seasons of his career in the Philadelphia Phillies and Baltimore Orioles organizations, reaching Triple-A Lehigh Valley in 2014, Simon has been an Atlantic League arm since 2015. Simon was named an All-Star in 2016 with the Bees, pitching to the tune of a 2.77 ERA over 120 and one-third innings. The 6’6″ right-hander is 2-2 this season with a 3.30 ERA over five starts and 30 innings, striking out 28 and walking just four. Simon last appeared exactly a week ago, taking the loss against the Sugar Land Skeeters after allowing three runs over seven innings of work. The California native is 3-3 in his career against the Ducks with a 3.35 ERA in 11 appearances (seven starts), striking out 36 batters in 45 and two-thirds innings, including one complete game. 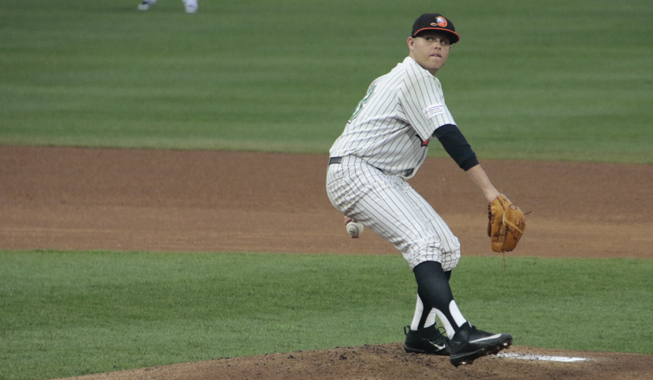 Simon defeated the Ducks on May 8, pitching six innings of one-run ball on eight hits, striking out six. BOT 1: In his first plate appearance at Bethpage Ballpark, Taylor Ard lifts a sacrifice fly to right field, putting the Ducks ahead 1-0! TOP 2: New Britain responds with six runs to take a 6-1 lead. Jamar Walton and James Skelton both homered in the frame. TOP 3: Skelton’s two-out, two-run double increases the Bees lead to seven. BOT 3: The Ducks get a run back, as Jordany Valdespin doubles and scores later on Travis Snider’s RBI groundout! TOP 4: Bees reclaim their seven-run advantage on Josh Thole’s two-out RBI single. BOT 4: Ramon Cabrera scores from third on a double play ball to make it a 9-3 ballgame. TOP 5: Walton’s second home run of the night makes it a 10-3 game in favor of the visitors. BOT 5: The runs keep being traded, as Alec Sole scores on Emilio Bonifacio’s RBI groundout. BOT 6: Daniel Fields connects for his first home run as a Duck! His solo blast to right-center closes the gap to 10-5. TOP 7: Deibinson Romero’s three-run homer to left pushes the Bees lead up to 13-5. TOP 9: Jason Rogers adds a two-out, two-run double. The Long Island Ducks and New Britain Bees continue their three-game series on Wednesday morning. This will be the second of 18 scheduled meetings between the Ducks and Bees this season and the 42nd all-time meeting between the two teams. Long Island trails New Britain by three games all-time with a 19-22 record against the Bees. The Bees defend their home well, with a 14-7 record over the Ducks in Connecticut. The Ducks bring an even 5-5 record to Tuesday’s game, while New Britain holds a 3-7 record having won three of their last four. Sometimes luck isn’t on your side in the game of baseball, and that was the case for the Ducks in the series opener against the New Britain Bees. The Ducks tagged four Bees pitchers for 12 hits, but were only able to push two runs across, falling to New Britain 5-2. Poor luck struck early as starter and Ducks Pitcher of the Week Andrew Barbosa left the game with an injury after just one and one-third innings pitched. The Ducks were able to strike first in this game, scoring a run on a Wilkin Castillo grounder in the second inning. New Britain jumped into the lead with a two-run homer off the bat of Conor Bierfeldt in that very same frame. The score remained the same until the Bees scored another off a sacrifice fly in the fifth inning and an RBI single from the next batter, making the score 4-1. Newly-acquired Duck Emilio Bonifacio scored the Ducks second and final run, doubling then getting sent home off a deep double from Travis Snider. The Bees got that run right back in the same inning off an RBI double by Reid Brignac. A scoreless ninth inning led to a 5-2 final score in favor of the Bees. The two newest Ducks, Emilio Bonifacio and Daniel Schlereth, looked great in their Long Island debut. Schlereth retired the side in his inning of work, striking out one. Meanwhile, Bonifacio went 4-5 with a pair of doubles and a run scored. Jake Dunning took the loss after filling in for the injured Barbosa, and starter Kyle Simon earned the win for the Bees despite allowing eight hits. Matt Larkins will take the mound for the second time in 2018 after a five-inning no-decision against Somerset to start his year. Larkins was the Ducks leader in strikeouts (139), innings pitched (156.0) and complete games (4) as the workhorse of the rotation in his very successful 2017 campaign. Larkins first joined the Ducks in 2016 following a cross-league trade with the Lincoln Saltdogs of the American Association. The California native was among Lincoln’s top-three in wins (7), ERA (3.69), and innings pitched (124.1) that season. In his career against New Britain, Larkins owns a 3.43 ERA in four starts, with 20 strikeouts in as 21 innings along with a 2-1 record. Former major leaguer Jonathan Pettibone will battle the Ducks on Wednesday morning. The 2008 third round draft pick reached the big leagues after five seasons in the Philadelphia Phillies organization and was a serviceable arm for them, making 20 starts in two years. Pettibone owned a record of 5-5 in the big leagues with an ERA of 4.45 before shoulder issues derailed his career. The Californian did not pitch in 2015 and failed to make the Chicago Cubs roster in 2016 after spring training. The 27-year-old righty spent last year with the Bees and had a rough season, going 2-8 with a 5.45 ERA. He hasn’t started this season successfully as well, allowing three earned runs in as many innings to Sugar Land and taking the loss. In four career starts against the Ducks, Pettibone is 0-1 with a 3.64 ERA across 17 and one-third innings pitched. UPDATE (10:50): TOP 1: Emilio Bonifacio steals second and Jordany Valdespin steals home! The double-steal gives the Ducks an early 1-0 lead! UPDATE (11:04): BOT 1: The Bees tie the game thanks to a bases loaded walk by Ozney Guillen, the third walk of the inning. UPDATE (11:13): TOP 2: Long Island regains the lead on a sacrifice fly to right off the bat of Valdespin! His league-leading 13th RBI of the year makes it 2-1 Flock. UPDATE (11:30): TOP 3: Wilkin Castillo delivers a two-out RBI single to plate David Washington, increasing the Ducks lead to 3-1! UPDATE (11:42): BOT 3: Bees grab a run with two outs in the third when Angelys Nina’s fly ball to left is dropped. Ducks lead is now 3-2. UPDATE (11:53): TOP 4: Another hit and an RBI for Bonifacio, as his single makes it a 4-2 ballgame in favor of Long Island! UPDATE (12:47): BOT 6: Following a pair of two-out walks, Deibinson Romero ties the game with a two-run single to center. 4-4 as we head to the seventh. UPDATE (12:59): TOP 7: It’s an INSIDE-THE-PARK HOMER! Robert Garcia’s liner to right sneaks past a diving Jamar Walton, and Garcia round the bases! The three-run homer puts the Ducks back in front, 7-4! UPDATE (1:37): FINAL: K-Rod retires the Bees in order to earn his first save with the Flock, and the Ducks win this one, 7-4, to even the series in New Britain! The Long Island Ducks take on the New Britain Bees for the first time in 2018. This will be the first of 18 scheduled meetings between the Ducks and Bees this season and the 41st all-time meeting between the two teams. Long Island trails New Britain by two games all-time with a 19-21 record against the Bees. The Bees defend their home well, with a 13-7 record over the Ducks in Connecticut. The Ducks bring a 5-4 record to Tuesday’s game, while New Britain holds a 2-7 record after taking two of three from the Road Warriors in their last series. While the last four games against the Blue Crabs were marked by fantastic offense, the bats were simply not there in the series finale on Sunday. The Blue Crabs pitching staff surrendered just three hits in the ballgame. The Ducks pitching staff had a showcase game as well, striking out 14 Blue Crabs batters. The Blue Crabs got on the board right away, as the red-hot Johnny Bladel doubled to kick off the ball game, then was driven home by a pair of groundouts to the second baseman. The score remained that way until the fifth inning, when John Brownell allowed a pair of runs after a single and sacrifice fly with two men on. Brownell was pulled the next inning in favor of Ashur Tolliver after allowing a two-out hit. The pitching coach left the ballgame with a very solid seven strikeouts through five and two-thirds innings. The Ducks bullpen was lights out the rest of the way, with Tolliver striking out three of five batters faced, along with Matt Marsh and Rob Rogers who struck out four batters combined in the final two innings. The bullpen allowed just three baserunners in the final three and one-third innings. John Brownell took the loss after allowing three earned runs, and Drake Britton got the victory after pitching five one-hit innings in his first start since 2015. Andrew Barbosa will be the starter for the Ducks on Tuesday. Barbosa got the job done in his first start of the season, allowing one earned run over five innings in a 6-4 victory against Somerset exactly one week ago. The 6-foot-8 lefty had great success during his first stint on Long Island in 2015, going 4-1 over nine starts with a 2.82 ERA and striking out 59 batters over 51 innings. The performance caught the eye of the Atlanta Braves, who purchased his contract and assigned him to Double-A Mississippi for the remainder of the season. Barbosa had a great 2016 in the New York Mets organization, dealing a 1.51 ERA across four levels in the organization, including Triple-A Las Vegas. The Florida resident then spent last season exclusively with Triple-A Colorado Springs of the Milwaukee Brewers organization. Barbosa owned a 7-3 record primarily out of the bullpen last year with a 5.29 ERA and 65 strikeouts over 66 and one-third innings. The Bees were not yet members of the Atlantic League when Barbosa last spent time with the Ducks, making this his first career start against New Britain. Atlantic League mainstay Kyle Simon will face the Ducks on Tuesday. After spending the first four seasons of his career in the Philadelphia Phillies and Baltimore Orioles organizations, reaching Triple-A Lehigh Valley in 2014, Simon has been an Atlantic League arm since 2015. Simon was named an All-Star in 2016 with the Bees, pitching to the tune of a 2.77 ERA over 120 and one-third innings. The 6’6″ right-hander lost in his first 2018 appearance against the first-place Sugar Land Skeeters, allowing five runs in as many innings. The California native is 2-3 in his career against the Ducks with a 3.72 ERA in 10 appearances (6 starts), striking out 30 batters in 38 and two-thirds innings. 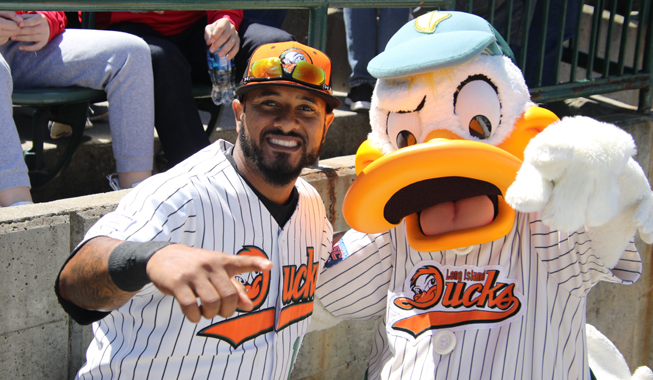 UPDATE (6:45): TOP 1: Emilio Bonifacio’s first Ducks at-bat ends with his first Ducks hit, a double to right! UPDATE (6:57): TOP 2: Long Island gets the early lead, as Wilkin Castillo’s RBI groundout scores David Washington! 1-0 Ducks. UPDATE (7:05): BOT 2: Andrew Barbosa exits tonight’s game after recording the first out of the second inning. Jake Dunning is on to pitch. UPDATE (7:15): BOT 2: Conor Bierfeldt puts the Bees in front with a two-run home run to left field. UPDATE (7:45): END 4: Jake Dunning has tossed back-to-back scoreless and hitless innings! Long Island’s offense has seven hits thus far tonight as well. UPDATE (8:02): BOT 5: New Britain adds a pair on a sac fly from James Skelton and an RBI single by Deibinson Romero. 4-1 Bees. UPDATE (8:30): BOT 7: Former big leaguer Daniel Schlereth retires the Bees in order in his first inning as a Duck! UPDATE (8:38): TOP 8: A booming RBI double by Travis Snider, which followed Bonifacio’s third hit of the day, has closed the gap to 4-2! UPDATE (8:55): BOT 8: Reid Brignac’s RBI double makes this a three-run ballgame once again. 5-2 Bees as we head to the ninth. UPDATE (9:06): FINAL: Jordany Valdespin picks up his third hit of the night, and Bonifacio earns his fourth! However, the Bees hang on for the 5-2 victory.